In Glantz and Glantz, P.A. v. Chinchilla (4D07-3279), the Fourth District reversed the trial courts reduction of an attorney fee award. The personal representative of the estate was a member of a prepaid legal services program. The prepaid program provided legal services at a 51% discounted rate, or $115 per hour [in this situation]. The attorney worked 123 billable hours and an expert testified that - with the discount - $13,500 was a reasonable rate for the services. The trial court entered an order awarding 50% of the reasonable rate. On appeal, "The law firm argues that the trial court abused its discretion in applying the 51% discount to the reasonable fee attested to by the expert without considering that the reasonable hourly rate had already been discounted by 51% pursuant to the prepaid legal services program." 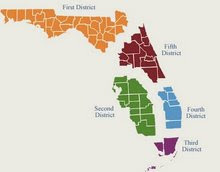 Reviewing for abuse of discretion, the Fourth District reversed. "Attorneys representing probate estates are entitled to receive reasonable compensation. § 733.6171, Fla. Stat. (2007). '[A] probate court should consider the nature of the services rendered and the necessity for their performance, together with the reasonableness of the charges'. The trial court accepted the expert’s affidavit that $13,500 was a reasonable, already discounted fee. The trial court did not find the hours or the discounted rate to b e unreasonable. Nevertheless, the trial court inexplicably reduced the reasonable fee by another 51%. In doing so, it abused its discretion. We therefore reverse and remand the case to the trial court to award the law firm $12,400 in attorney’s fees plus costs."